Welcome to the 2012 WI SHRM State Conference Speaker Handout page. We encourage you to view the various speaker handouts. In an effort to go green, we will not be providing any handouts at the conference this year. Therefore, if you would like to have a copy while attending the learning sessions you will need to print a copy from this webpage and bring them with you to the conference sessions. You will be able to download and print a copy of these handouts by moving your mouse over and clicking on the pdf icon which is located in the last column entitled "Session Handouts" located below. These handouts are in pdf format and due to the file size of some, it may take a few minutes to download. If the last column entitled "Speaker Handouts" is blank, that indicates that WI SHRM has not received the handouts for that session as of this date. 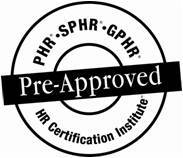 HRCI has reviewed the 2012 Wisconsin SHRM State Conference presentations and confirmed the credit allocation information. PLEASE NOTE: We will continue to update this page as more information is received. We look forward to seeing you in October at the 26th annual WI SHRM State Conference in the Wisconsin Dells!